Like nearly everyone who has ever experienced it, I hate cystic acne. I hate the pain they cause with even the slightest touch, and the way they linger for days and often, weeks. I hate the way they feel larger and heavier than they actually are, and most of all, I hate that there isn’t much I can do but wait once a cystic outbreak appears. Sure, there are things I hate more – like pictures of feet, war, and natural disasters. But sadly, there are no products (that I know of) I can purchase to stop any of those things. 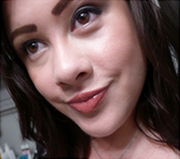 There are, however, a small handful of products that claim to treat cystic acne. The way I see it, if I’m going to be forced to encounter the occasional foot picture on Instagram, that perhaps it wouldn’t hurt to shell out $40 for the product I’ll be reviewing today, Renée Rouleau Anti-Cyst Treatment. 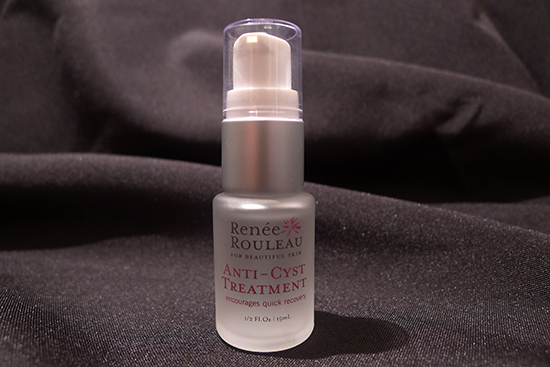 Renée Rouleau Anti-Cyst Treatment is a spot treatment serum designed to heal and reduce inflammation of cystic acne. This product claims to reduce recovery time by approximately 50% on average. According to the Renée Rouleau website, this product contains ingredients that will decrease bacteria, reduce inflammation, and dissolve pore-blocking dead cells, as well as a special ingredient that helps the formula to penetrate the skin more deeply than the active ingredients alone. Lactic Acid – Lactic Acid is an alpha hydroxy acid, which is a group of food-derived natural acids that have been clinically proven in a multitude of studies to effectively treat acne, improve acne scars, firm and smooth the skin, and in smaller amounts, moisturize. Lactic acid in particular is milk-derived, and happens to be less irritating than other AHAs such as glycolic acid or citric acid. There has been plenty of research on the efficacy of lactic acid, such as this one from the Department of Dermatology and Venereology at the All India Institute of Medical Science, which shows long term topical application of lactic acid to be a highly effective treatment against acne. Carboxy Methylcellulose – This water-soluble polymer is the special ingredient that helps this formula penetrate the skin more deeply than the active ingredients alone. It also happens to be an effective stabilizing agent. According to COSDNA, this product contains no red flags in terms of acne triggers or potential irritants. 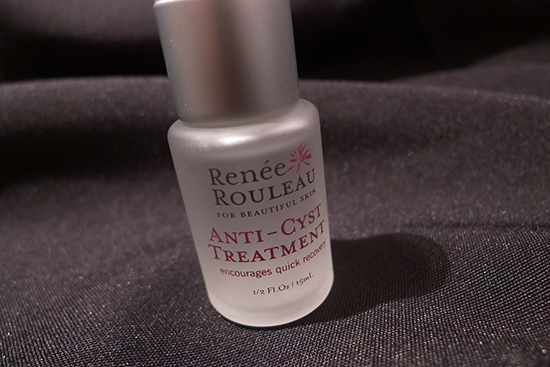 Renée Rouleau Anti-Cyst Treatment comes in a small, frosted glass bottle with a pump. The pump is very well constructed, and I find it easy to control the amount of product I dispense. Be warned – Renée Rouleau Anti-Cyst Treatment smells funky. The smell is very sour and medicinal. The instructions say to apply one drop nightly onto clean skin as soon as the cyst forms. I find one drop to be a lot for me, even for my larger cysts. When I use Renée Rouleau Anti-Cyst Treatment, I only use about half a drop for one cyst, and this is plenty. The Renée Rouleau website also says this treatment can be used 2-3 times a week as a preventative measure on areas prone to cystic acne. When I use the Anti-Cyst Treatment this way, I use half a drop on the cyst, then gently dab the remaining product over my acne prone areas. I’ve used Renée Rouleau Anti-Cyst Treatment a total of 20 times over the past four months. I find that it does seem to reduce the healing time of a cyst, though I couldn’t really find a good scientific way to measure how much the healing time reduced. I just know it seemed shorter. It didn’t feel like magic – I didn’t dab this serum on and then wake up the next morning cyst-free. In addition to newly formed cysts, I also tried this serum on cysts that were a week or so old. It seemed to work for them as well, but once again – I have no way to measure how much the healing time was shortened. I just know that it seemed faster. I did experience some drawbacks, however. Even though lactic acid is a gentler AHA, it was often still too much for my sensitive skin. I also suspect my acid sensitivity is magnified by my Retin-A usage. When I tried to use the Anti-Cyst treatment as a preventative measure in acne-prone areas, I actually got more breakouts. Many of those breakouts were, ironically, cysts. Because of this, I have to be very careful when I use this product to only use it on an affected area, and not to use it for too many days in a row. Someone who is not as sensitive as I am would probably fare much better with this product as a preventative treatment. Overall, I’d say this product works, and it’s certainly a viable solution for someone who gets an occasional cystic outbreak. It’s not an overnight miracle, but it does seem to accelerate the healing time noticeably. For cysts that are not newly formed, I think this product is more effective than putting a cold compress on the area, but less effective than a cortisone shot from a dermatologist. For newly formed cysts, I’ve personally had great results from cold compressing. Personally, I think cold compressing was more noticeably effective than the Renée Rouleau Anti-Cyst Treatment, but the Renée Rouleau Anti-Cyst Treatment was definitely easier and less time consuming to do. My cold compress method involves wrapping a paper towel around a ziplock bag full of ice, and pressing it onto the cyst in 5-minute intervals throughout the day. It’s not really something I can do at work, and we all know cysts don’t care whether or not it’s the weekend. I think this product would certainly be worth the $40 price tag if my skin weren’t so sensitive. I believe those who can easily tolerate AHAs would benefit greatly from this product, but I probably won’t repurchase it. I bought my Renée Rouleau Anti-Cyst Treatment from the Renée Rouleau website, where it retails for $40. Wow, you hate pictures of feet that much? I’d stare at a picture of gross feet every day if it prevented me from getting cystic acne. I hate pictures of feet an swful lot. I just think feet are gross overall, no matter how well groomed or symmetrical they are. Fortunately, I don’t have to look at a lot of bare feet in a typical day, but I do get ambushed on Instagram a lot. I guess if it really came down to it, I’d rather look at a picture of a foot for a couple of seconds than deal with a cystic acne. However, I would – without question – take the acne over having to interact with a bare foot in person! I recently had a cystic acne outbreak after trying a Mizon Snail Gel Cream. When I say “outbreak” I’m talking a 3″ by 2″ strip on either side of my chin of solid cystic acne. As cold compresses seem to more damaging than helpful for me, my only recourse over the years has been a dab of advil liquigel to slightly reduce swelling. But I recently stumbled on my HG treatment, and I can’t believe I never knew this before. It’s Prid’s Drawing Salve http://www.hylands.com/products/prid-drawing-salve and it’s my new problem solver. It doesn’t make the cyst go away, it draws the infection to the surface in a white head within 6 hours. Then I just use a warm compress to open and release the infection. Then I use a Lavender toner compress to soothe and seal, and continue my skin routine as usual. From the first application to almost healed takes a week. I’m sure my Benton products are helping speed the healing, but there’s no denying the effect of the drawing salve. Within that magic 6 hours, I can feel a tingling and bubbling similar to using hydrogen peroxide on a wound. Over a period of an hour, I watched one spot in particular go from painful cyst to centralized white head, then within 24 hours look like nothing more than a slightly hyperpigmented dry spot. There are other brands of drawing salve that should work as well, but they’re nearly black in color and stain. Also, I picked up my Prid’s for less than $5.00 at my local walmart. It’s hard to argue with something that took me from pain to pleasure in less than 3 days. what?? that’s crazy! how did it turn the cyst into a whitehead so quickly??? i must look into this. benton’s snail essence broke me out really badly 🙁 i’m scared to try products with snail slobber now. I contemplated buying this anti cyst treatment for several months before I actually went ahead and purchased it because every other product I’ve used that got a lot of hype never delivered positive results. I was skeptical, but I’ve used it for approximately 2 to 3 months now and I do think it works. As with any acne treatment, it doesn’t work overnight, but with continued use, it has delivered gradual improvement. At least for me it has. Might not work for everyone, but I think you should try it. Can’t hurt to try it.